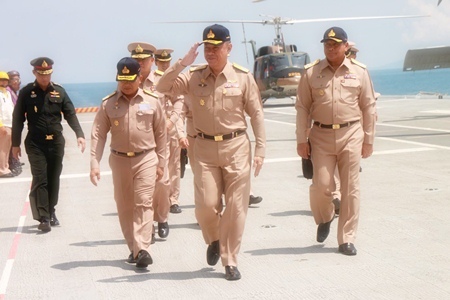 Presiding over the Royal Thai Navy’s annual training exercises in Sattahip, Thailand’s top military commander ruled out negotiations with Cambodia until that country’s forces cease hostilities in the latest rounds of deadly border clashes. 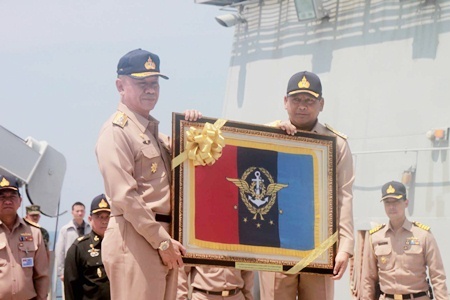 Supreme Commander Gen. Songkitti Jaggabatara said during an April 22 speech at Sattahip Naval Base that Thai forces were “resolute” in protecting the country’s sovereignty and will not hesitate to attack Cambodia forces if necessary. “Negotiations are not in the plans if our enemies choose to disrupt peace in our country,” he said. 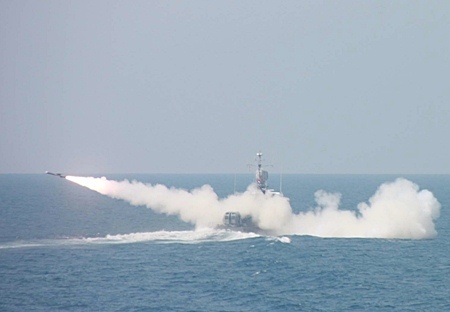 Navy forces fire an Exocet missile from the HTMS Ratcharit, a fast-attack boat, during regularly scheduled military exercises in the Gulf of Thailand near Sattahip. Whilst watching the exercises, Supreme Commander Gen. Songkitti Jaggabatara said that Thai forces were “resolute” in protecting the country’s sovereignty. Ten people were killed in the first three days of heavy artillery exchanges near Ta Kwai temple in Surin. Thailand accuses Cambodia of trying to seize both Ta Kwai and nearby Ta Muen temple in a move similar to its occupation of the disputed Preah Vilhear temple about 160 km from the latest fighting. United Nations Secretary-General Ban Ki-moon has urged both sides to agree to an immediate cease fire, but Thai leaders say their Khmer counterparts are trying to escalate the situation in order to force international involvement in border disputes Thailand wants solved bilaterally. 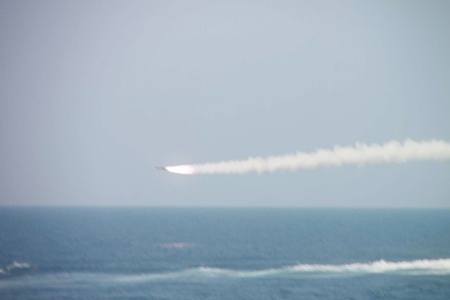 Hoping to provoke international outrage, Cambodians have claimed Thais are using air strikes and chemical weapons on their military, which is about 25 times smaller than Thailand’s. Thai leaders denied both. 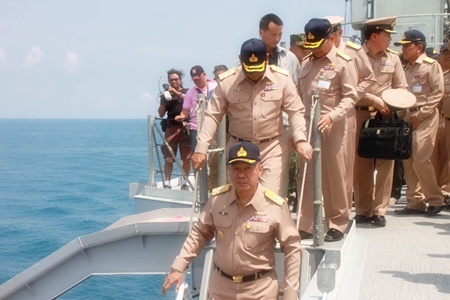 Supreme Commander Gen. Songkitti Jaggabatara returns salutes as he boards the HTMS Chakri Naruebet to watch naval exercises off Sattahip. In Sattahip, Songkitti said 15,000 villagers have been evacuated from the battle zone. He said he hoped hostilities would cease soon, but also has been asked to approve the dispatch of five more battalions to the area to protect the two temples. At his Sattahip war games appearance, the supreme commander certainly did his best to show of the might of Thai forces. 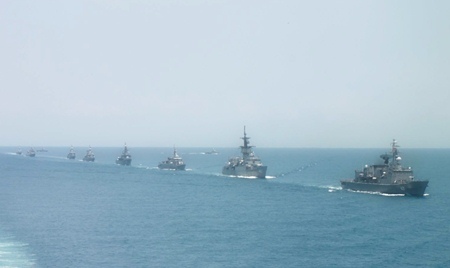 Part of Thailand’s naval fleet underway in formation during naval exercises in the Gulf of Thailand last week. 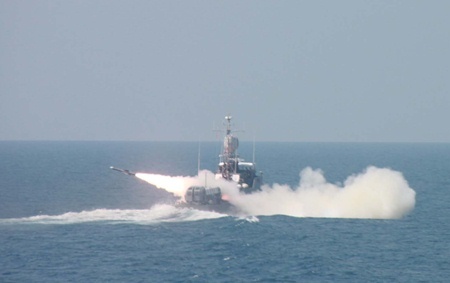 From a perch on the helicopter deck of the HTMS Chakri Naruebet, Songkitti watched as Navy forces fired an Exocet missile from the HTMS Ratcharit, a fast-attack boat. 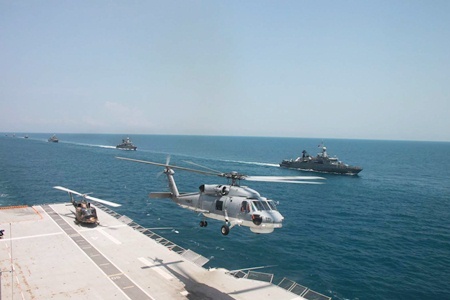 Other exercises included anti-aircraft firing, artillery practice with live rounds and joint sorties by Royal Thai Navy and Air Force F-16s. 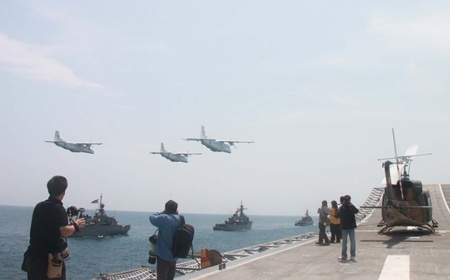 Navy commander Adm. Kamthon Pumhiran said the war games were a previously scheduled, annual exercise put on to better integrate the operations of various naval units.